Our professional PCE-322 A sound level meter is suitable to take measurements in the industrial sector, for health and safety and to control internal environments such as those with noise contamination. Its internal memory of 32,000 values makes it possible to use this sound level meter with data logger to save data over long periods of time. The readings can be transfered to a PC via an RS-232 cable. The Windows compatible software (in English) allows for the data to be visualized in tables and graphs. The zoom function allows for a more detailed analysis of the sound values. This software is not compatible with Windows NT, if this is the case, you should use Windows hyperterminal to transfer the data to Excel to be processed. 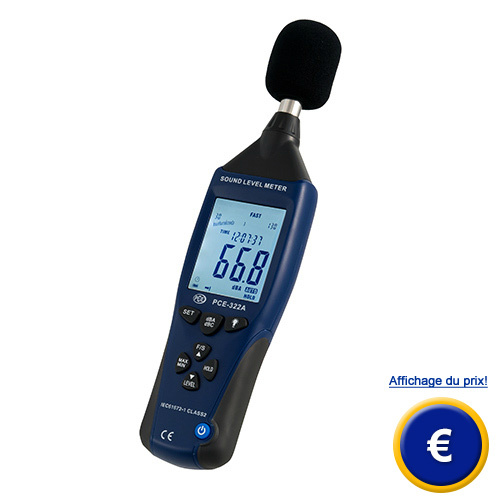 The sound level meter with data logger can be used to measure directly or to save readings over a long period of time. The data can be transfered to a PC via an RS-232 connector or by analogue output and analysed in various formats. The software that is included allows you to trasfer the readings to other programs so it can be analysed and processed. You can create diagrams, columns and view the peak values. The zoom function allows for a closer analysis of each reading. The software is also useful to programme settings for measurements over long periods of time. 0 to 40°C, < 80% r.h.